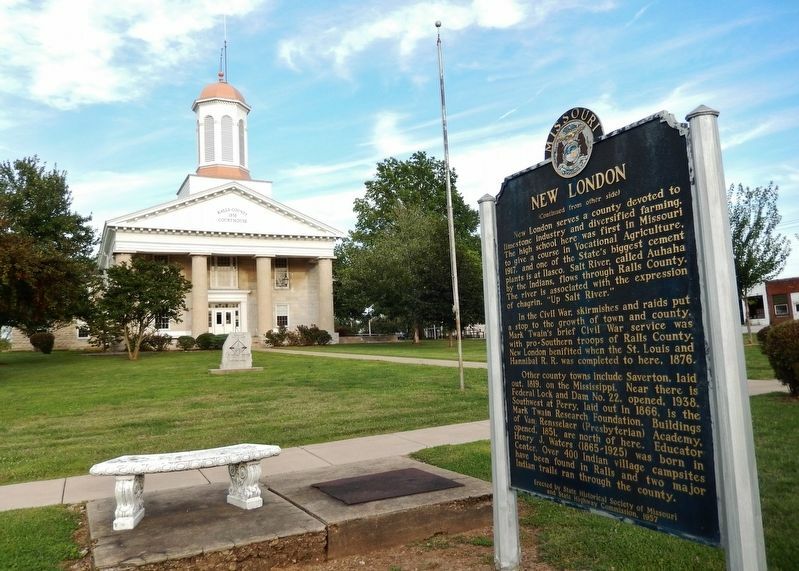 New London, renowned for its handsome courthouse, was founded, 1819, on the route of the historic Salt River Road by William Jamison. 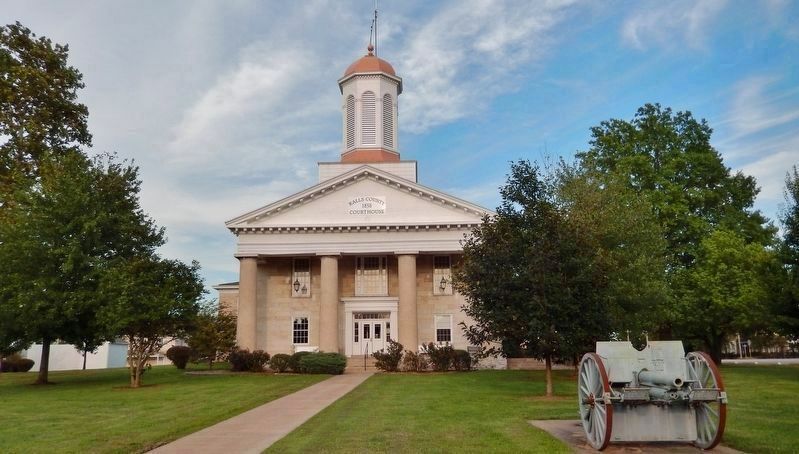 By 1820, it became the seat of a newly organized county named for Daniel M. Ralls, local legislator. 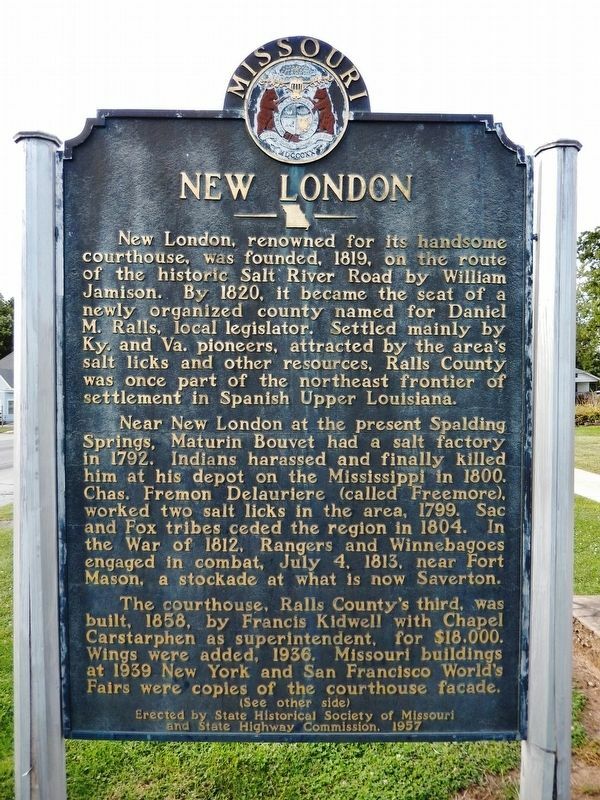 Settled mainly by Ky. and Va. pioneers, attracted by the area's salt licks and other resources, Ralls County was once part of the northeast frontier settlement in Spanish Upper Louisiana. Near New London at the present Spalding Springs, Maturin Bouvet had a salt factory in 1792. Indians harassed and finally killed him at his depot on the Mississippi in 1800. Chas. Freemon Delauriere (called Freemore), worked two salt licks in the area, 1799. Sac and Fox tribes ceded the region in 1804. In the war of 1812, Rangers and Winnebagoes engaged in combat, July 4, 1813, near Fort Mason, a stockade at what is now Saverton. 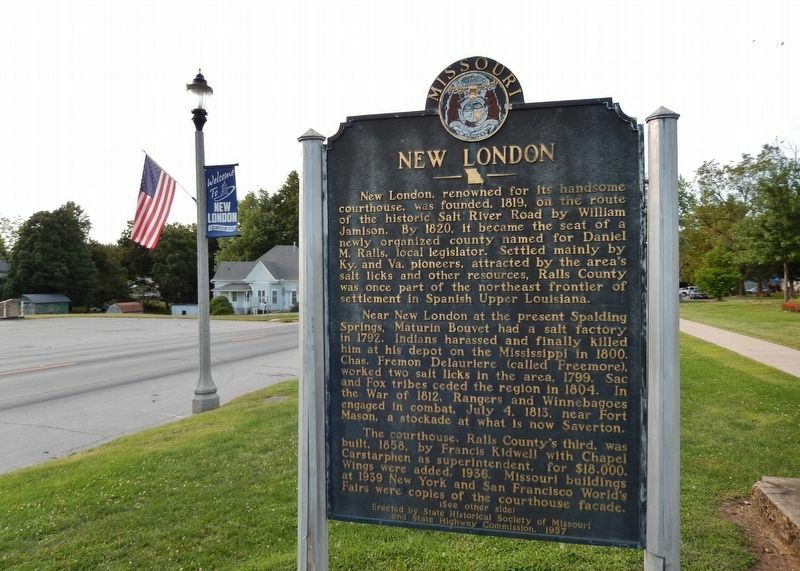 (side 2)(Continued from other side) New London serves a county devoted to limestone industry and diversified farming. The high school here was first in Missouri to give a course in Vocational Agriculture, 1917, and one of the State's biggest cement plants is at Ilasco. Salt River, called Auhaha by the Indians, flows through Ralls County. The river is associated with the expression of chagrin, "Up Salt River." In the Civil War, skirmishes and raids put a stop to the growth of town and county. Mark Twain's brief Civil War service was with pro-Southern troops of Ralls County. 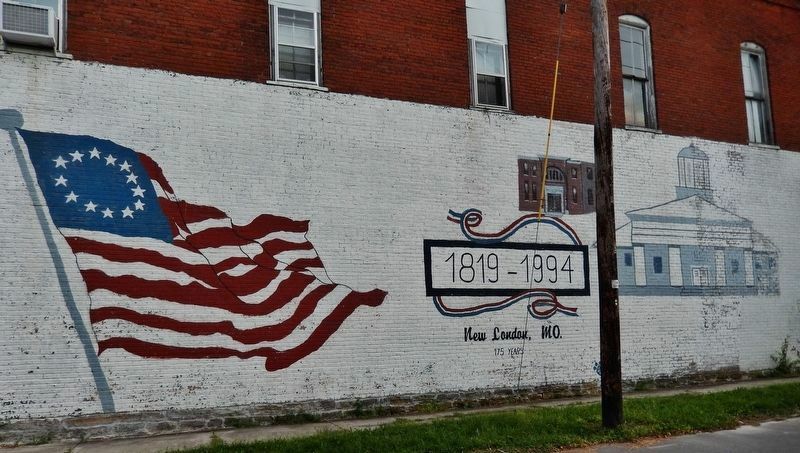 New London benefited when the St. Louis and Hannibal R.R. was completed to here, 1876. Other county towns include Saverton, laid out in 1819, on the Mississippi. Near there is Federal Lock and Dam No. 22, opened, 1938. Southwest at Perry, laid out in 1866, is the Mark Twain Research Foundation. Buildings of Van Rensselaer (Presbyterian) Academy, opened, 1851, are north of here. Educator Henry J. Waters (1865-1925) was born in Center. Over 400 Indian village campsites have been found in Ralls and two major Indian trails ran through the county. by State Historical Society of Missouri, and Missouri State Highway Commission. Marker series. This marker is included in the Missouri, State Historical Society of marker series. Location. 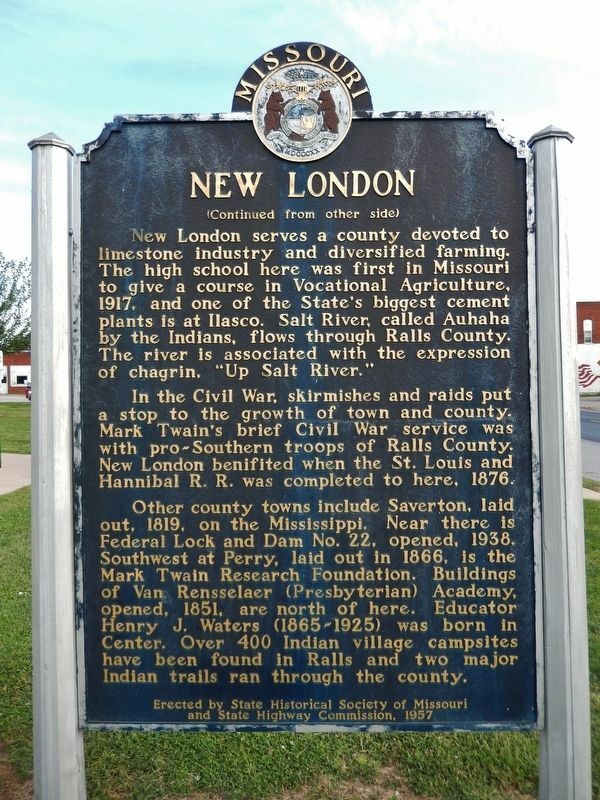 39° 35.162′ N, 91° 24.062′ W. Marker is in New London, Missouri, in Ralls County. Marker is on Main Street (Business U.S. 61) north of 4th Street, on the right when traveling north. Touch for map. Marker is located beside the sidewalk, directly in front of the Ralls County Courthouse. Marker is at or near this postal address: 311 South Main Street, New London MO 63459, United States of America. Touch for directions. Other nearby markers. At least 8 other markers are within 9 miles of this marker, measured as the crow flies. William Henry Hatch (approx. 8.8 miles away); a different marker also named William Henry Hatch (approx. 8.8 miles away); Becky Thatcher's Home (approx. 9 miles away); Mark Twain's Father's Law Office (approx. 9 miles away); Mark Twain's Boyhood Home (approx. 9 miles away); Abner Nash Building (approx. 9 miles away); The Jail in "Tom Sawyer" (approx. 9 miles away); Grant's Drug Store (approx. 9 miles away). More. Search the internet for New London. Credits. This page was last revised on April 11, 2019. This page originally submitted on April 8, 2019, by Cosmos Mariner of Cape Canaveral, Florida. This page has been viewed 115 times since then. Photos: 1, 2, 3, 4, 5, 6. submitted on April 10, 2019, by Cosmos Mariner of Cape Canaveral, Florida.